Commercial Litigation - Buell & Elligett P.A. Breach of contract: Reliance on supplier, vendor, manufacturer, retailer, distributor and contractor agreements is a prerequisite to business success. When one party fails to comply with the performance or delivery terms articulated in the contract, our firm works with all involved to find alternative means of fulfilling the contract to the satisfaction of both parties without resorting to courtroom litigation, where possible. If a negotiated outcome seems impossible, our firm will not hesitate to take your case to court. Business torts: When your business has suffered financial losses as a result of someone else’s negligence, the attorneys at Buell & Elligett can help you pursue full and fair compensation for the negligent parties’ tortious conduct. We handle cases involving fraud, negligent misrepresentation, tortious interference with business or employment relationships, unfair competition and much more. Insurance coverage for businesses: Businesses may have claims under their own insurance or need the protection the casualty insurance they purchased was designed to provide when faced with claims. Buell & Elligett can analyze potential coverage issues in a variety of contexts. For more information on our wide insurance coverage practice, please refer to the Insurance Coverage practice area page. Other commercial litigation: Buell & Elligett has handled a broad range of litigation relating to corporate responsibility, executive compensation, breach of fiduciary duty, violations of professional ethics and many related matters. We invite you to schedule a free initial consultation to discuss your case with us in detail. We invite you to call (813) 874-2600 or email us with questions or concerns about your case. We offer a free initial consultation, and we undertake select matters on a contingency fee basis. The firm has actual trial experience in contract, business tort and other commercial litigation matters. 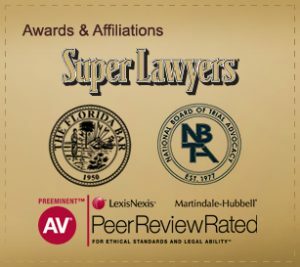 Mark Buell is Board Certified by The Florida Bar in both Business Litigation Law and Civil Trial Law. As with other litigation matters, the firm uses a team approach to preparing and trying cases. The team includes Board Certified appellate lawyers Tom Elligett and Amy Farrior.